For the first time at an Olympic Games, the International Olympic Committee has commissioned three artists to take residence in the Olympic host city during the Games fortnight. The trio is formed by a well-established writer – Tilman Spengler, an up-and-coming vine artist – Gerald Andal, and monumental-urban-intervention artist JR. All of them have spent their time in Rio during the 2016 Olympic Summer Games and produced work in response to their direct experience of the Olympic city. The IOC explains the importance of this scheme by citing the original aspirations of the Olympic Movement and its pursuit of “Olympism” as a “philosophy of life, exalting and combining in a balanced whole the qualities of body, will and mind” which requires “[b]lending sport with culture and education” (Olympic Charter, 2013). The Olympic Movement Agenda 2020 is acting as a roadmap to realise these aspirations, with Recommendation 26 setting to “further strengthen the blending of sport and culture at the Olympic Games and in between” with a series of specific actions. 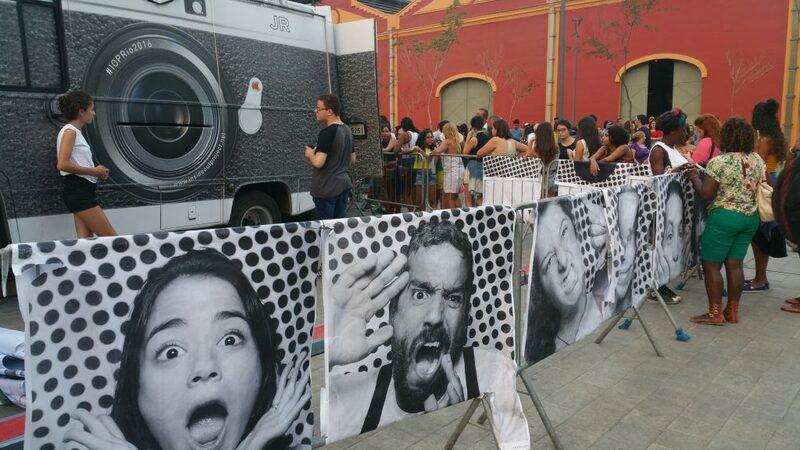 The impact of having an Artists in Residence programme has been noticed immediately in Rio. As it was to be expected, the work of French artist JR is the one attracting most public attention, both due to its high visibility in the public domain but also because it links to a long-term commitment by the artist and his team towards Brazil and Rio communities in particular, as environments where art can trigger social change. 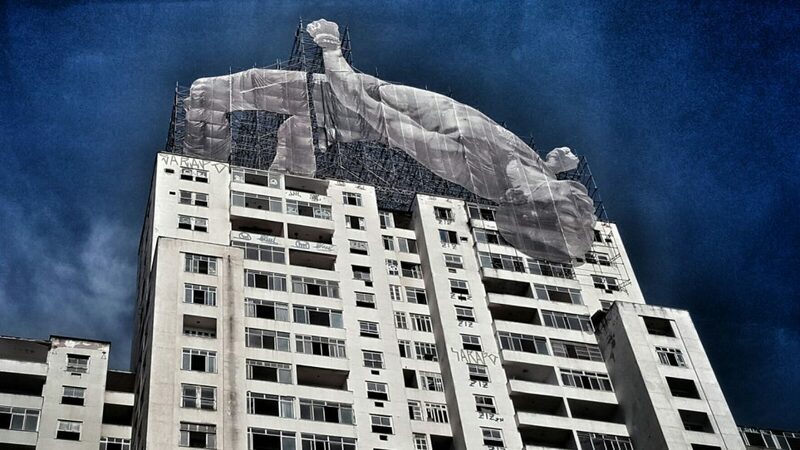 Three Giants (JR’s largest commission to date, fully inspired by the Olympic Movement) have popped on top of buildings and emerged out of the water across the city – these ‘Giants’ are the choice image by most international media stories on this topic to date. However it is the continuation of the Inside-Out project which is touching closest to the heart of audiences and Games participants at large. The Rio 2016 Inside-Out work involves enlarged pictures of people that are then used to cover building facades at key Olympic city locations. The choice of sites and communities for this intervention is a good expression of what is meaningful within the Olympic city and the many ways people engage with the Games beyond the sporting venues and competition itself: The Maracanã stadium and Games volunteers in the lead up to the Rio Opening Ceremony; the Boulevard Olimpico and olympic city festival goers during the first week of the Games; and the Olympic Village with its resident athletes during the last week of the Games. Each of these spaces and the people populating them offer a distinct visual story of Games time engagement and celebration that is now captured and expressed in the city’s walls. It is also important to reflect on the merits of the other two artist choices. Gerald Andal has been chosen as an exponent of what appeals to the youngest audiences and the new capacities for expression that are emerging via the latest social media trends. It is unclear how lasting can a ‘vine’ be beyond the spur of the moment, but it is apparent that Gerald (or @gereezi) committed community of followers will watch these 6 second clips over and over again. It is also apparent that this work offers a completely different way of capturing the Olympics, including a mosaic of feet as well as hands of passers by in #Rio2016 (as well as a taste of popular and touristy Olympic city treats: from Copacabana frozen coconuts, to people’s much loved Olympic-ring plastic glasses). Of all these artists, the one that may end up surprising the most is writer Tilman Spengler. 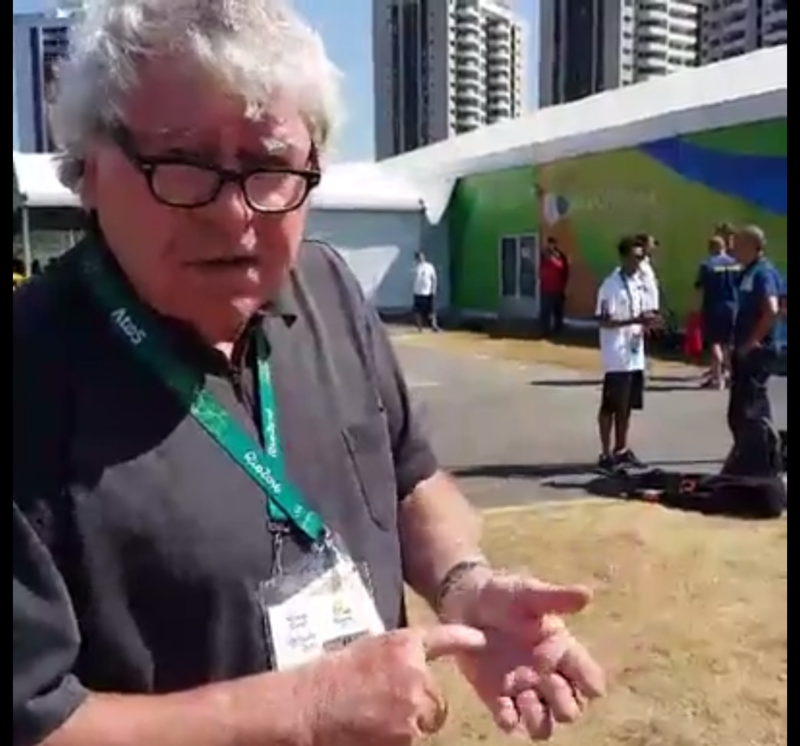 Mainstream media may not focus as much attention on a writer as documenter of the Games, but there is much need for alternatives in the ways we narrate, celebrate as well as critique the Olympic experience and Spengler is better equipped than most to provide enriching provocations. Building on his long-term interest in the significance of mass-scale social gatherings, Spengler proposes to write ‘palm stories’ around the Olympics. He will publish short reflections about his experience wandering through public spaces, official sites as well as behind-the-scenes areas in the Olympic city. Find a brief interview by Beatriz Garcia during Tilman Spengler’s visit to the Olympic Village, here. All in all, the Artist in Residence scheme opens an important chapter in Olympic Games cultural programming. After the mixed experience of the much needed – but little appreciated – Cultural Olympiad as a platform for contextualising the meanings and creative potentials of the Games and its host city, this initiative offers a specific – and probably, easier to explain – opportunity to take stock and raise attention as to the role that artists can and should play at the Olympics. A Cultural Olympiad, driven by the host city and country (while inspired and open to the contributions of the broader Olympic Movement) continues to be essential as a counterpoint to the sporting competitions and should keep growing and developing in future Games editions. All the same, having the IOC directly involved as a commissioner of art sets an excellent precedent to raise expectations and make everyone aware that this is central – not tangential – to the Olympic mission. This first Residence programme has offered diversity in age, status, art form focus, outreach and direct communities of interest. I have missed women and non-western backgrounds in the choice of artists, but we all know it is impossible to hit all boxes at once and this is surely something that future editions will address. With Agenda 2020 making such clear point about the role of culture an art within the Olympic Movement, this in an exciting time for Olympic cultural policy development and a great opportunity to raise the quality and impact of Games time cultural interventions.